Hanacure: Hype or Holy Grail? 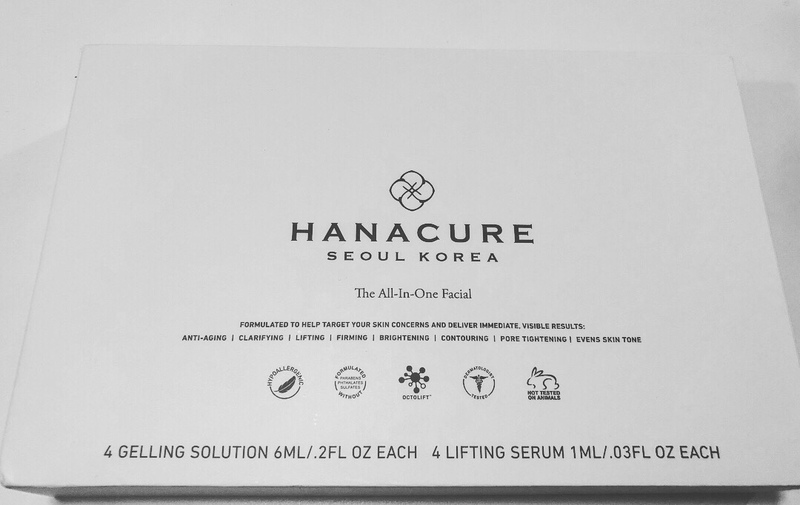 For a while now I’ve been seeing ads and posts for Hanacure’s miracle at-home facial kit and after months of thinking about it I finally tried it. It is being touted online as the anti-aging treatment of the year. Celebrities and Social Media Influencers are doing it and loving it, so with all the benefits it promises what’s not to love? For some, the price tag. I ordered the 4 application kit from the company’s website I paid $119 including shipping. While that is on the high end of over the counter treatments I feel like it is a reasonable price to pay for an at-home facial though considering you’re not paying a tip or sales tax on each treatment. If you get can past the price tag (and it’s in stock) you’re going to get a fancy white box in the mail. 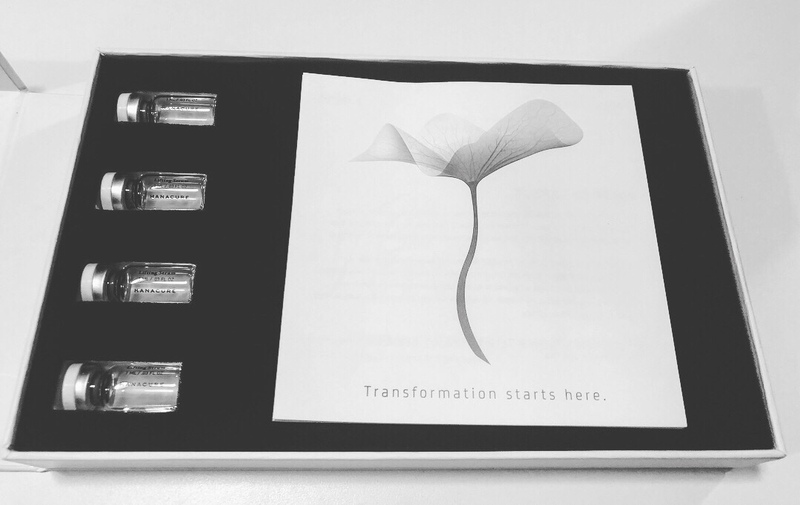 The packaging is clean, sleek, and refined, I’ll give them that! These photos were taken with my phone and look fine there, but seem blurry here in WordPress for some reason. Sorry about that! In order to use the treatment you’ve got to peel back the edge of the square gel tray. Next remove the metal seal, uncork the lifting serum, and pour it into the gel. Sometimes a bubble with form and the serum won’t pour out, so just blow into it to pop the bottle and keep pouring. Then fold the corner of the tray back down, hold it closed with your thumb, and shake it up. You’ll feel when it becomes a gel. After that open the gel, dip the brush into it (included in the kit), and start covering your face with it. This is a mask, so think of it that way when applying it. Coat your face as evenly as possible. If you sit in front of a fan you’ll feel the tightening effects faster, but all in all it will start tightening on its own. You might be tempted to make funny faces and take pictures like those you’ve seen online but the company actually discourages that as it doesn’t let the product work on all the areas of the face (where the cracks in the mask form). Wait about 30 minutes and wash it off. What do you get? Well, I got nothing special, even after doing all the applications. I noticed no brightening. I did see some tightening along my cheeks and jawline, but it is a short term result and was gone the next morning. My forehead and cheek areas were red from the pulling effect of the mask. That went away by the next morning. I noticed no minimized pores and no impact on fine lines (I’m 34). I’m sad to report that Hanacure did nothing special for me and that the whole experience was pretty disappointing. Granted, I am light skinned and have minimal wrinkles. So, perhaps someone with other skin concerns might have different results. Is it worth the money? For me? Meh. I’d say no. Remember, YYMV though. Would I buy it again? Nope. I wish I had saved my money. Was there anything positive about my experience with Hanacure? Yeah. The box is pretty, it didn’t break me out or cause any allergic reactions, and it was a fun thing to do on a night when I had some free time. Did you try Hanacure? What did you think?